And after the failure of the serious attempts by the criminal regime to criminalize the Khilafah as part of Islam, because the idea of ​​the Khilafah has spread among the people, and they believed that it is an integral part of their Deen, this criminal system tried and still tries to erase it from the formal education curricula, it even cancelled examination results of the Khilafah subject. Not only that, but it covered its failed attempts with the opinions of the Indonesian Council of Scholars in the need to abide by the National Charter. This criminal regime tried and tries to separate the Khilafah from Islam depending on the words of the English agent, Ali Abdel Raziq in his book Islam and the Foundations of Political Power, his view is that the Khilafah has nothing to do with the Deen. As for the National Charter, Muslims in any place and time are an integral part of the Islamic Ummah, the Ummah of Muhammad ﷺ, which is the best nation that was brought to mankind. It is an ancient nation which the Messenger of Allah ﷺ has built, cultured, and united on the Islamic creed alone. The Islamic creed based on the Qur’an and Sunnah is its real bond. It is its universal charter, since this Ummah was one Ummah, united by one doctrine from which its system emanates. This Ummah is not a new nation, nor a nation separated from others, and has its original charter, namely Islam, which is the Qur’an and the Sunnah, in which is its doctrine and the rules of its Deen. Therefore, the Ummah does not need any new charter, or the so-called National Charter. As for the English agent, Ali Abdel Raziq in his book Islam and the Foundations of Political Power, his view is that the Khilafah has nothing to do with the Deen. This has no value. This book was published in April 1925, after the Khilafah (Caliphate) was abolished on March 3, 1924 CE/ 1342 AH, while Al-Azhar in Egypt led the forefront of this call and began a strong activity in Egypt’s political and religious circles aimed at discussing the issue of the Khilafah and deciding on it. They concluded that there is a need to convene an international Islamic conference attended by representatives of the Islamic countries, to be based in Cairo under the sponsorship and supervision of Al-Azhar. This book and its writer have been violently opposed due to its blatant contradiction with the Islamic constants on the one hand, and matching all the conformity with the aims of the English and colonial policy in the Islamic world on the other. The English wanted to destroy the Khilafah (Caliphate) and destroy every idea in order to bring it back. This is the primary purpose of the whole book. So this how they were before, and this how they are now. Now America’s agents are following their way. (1) Defining the Islamic Shariah as purely spiritual and has no relationship to ruling and life’s affairs. (4) That the mission of the Prophet was to give the message of the Shariah devoid of ruling and its execution. (7) that the government of Abu Bakr and the rightly guided Caliphs after him, may Allah be pleased with them were not religious. Based on this, the writer was taken out of the clique of scholars on Wednesday, 22 of Muharram 1344 AH corresponding to 12 August 1925 CE. Thus, the writer and his book, with its complete violation of Islam, has no connection to Islam. The denial of the Khilafah (Caliphate) is a denial of what is known from Islam by necessity, rather it is the denial of the most important duties and the crown of obligations in Islam. 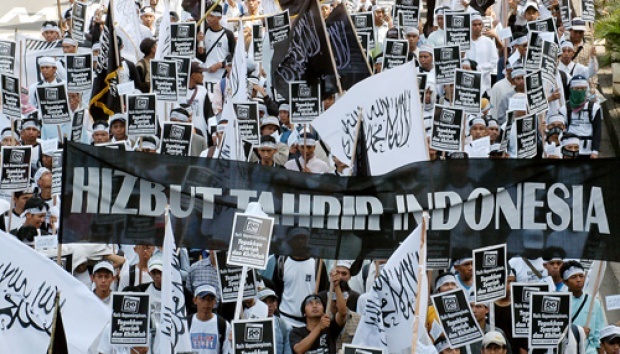 This is because the Khilafah is a vital issue for the entire Ummah, including the Indonesian people, the Khilafah is the source of its strength, power and revival as a long-standing nation, and it will become the number one state in the world, and will not be denied except by the losers.